After several days of rain and clouds the wind has come up and cleared the skies. Taking a break from cleaning up Christmas seemed like a good idea so I took a ramble through the yard to see what might be new. Under the heading of not-so-good are my ferns. I've been so happy with the way they have filled in the back fence border...in an area that is under the privets and partly shady I've mostly had cranesbill, allysum and often annuals filling in between smaller shrubs. 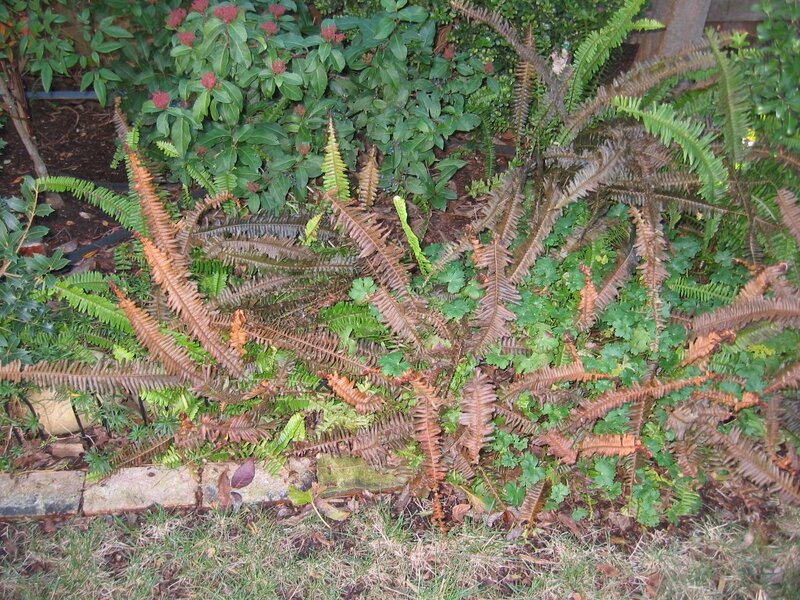 The ferns were 4 inch sword ferns and have spread well (which also means not in an invasive way!) The frost we had over the last few weeks browned a lot of the fronds...so now I'll get to look at that until March or so when it will be safe to cut the dead parts and see what happens. On to better things...the tulbaghia fragrans (related to society garlic, which I also like and have, but prettier and much earlier blooming) is starting to bloom. 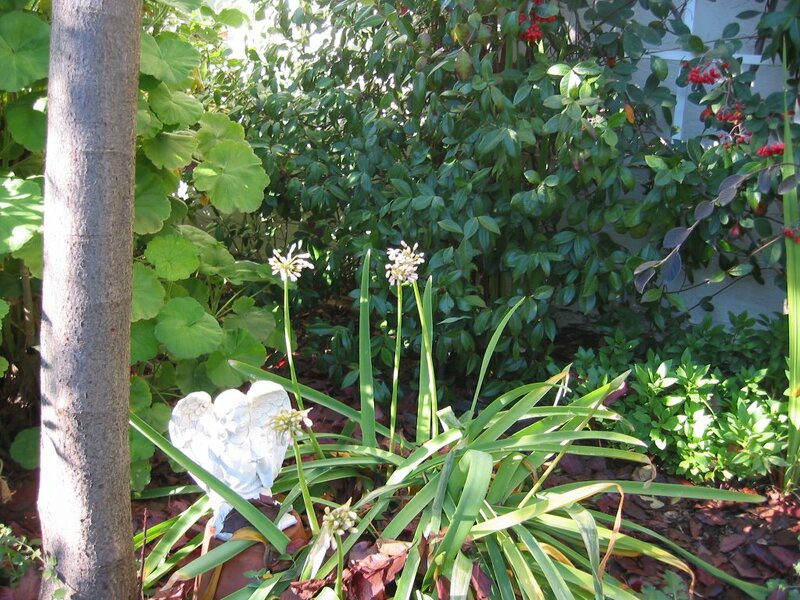 I'm always pleasantly surprised to see it blooming this time of year...a mid-winter reminder of spring to come. And over near the zapped ferns the summer snowflakes are putting on good growth and the buds on the camellia are becoming quite plump. My Variegated Pink lemon is holding its own. The snails really enjoyed the leaves last year. Taking a hint from someone's blog (thank you whoever you are!) I got a copper scrub pad, pulled it apart and surrounded the trunk. It seems to be doing the trick keeping the little guys at bay for now. 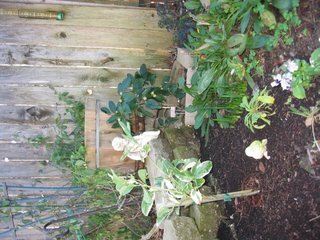 It is also the only citrus I have in the ground...my Meyer lemon and Bearss lime (mojito anyone??) 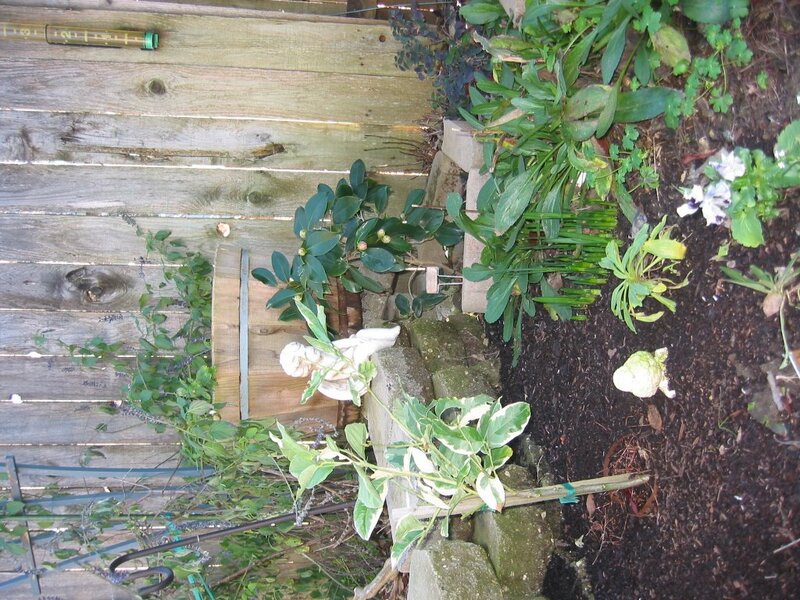 are in pots an d I've strung Christmas lights on trellises to help them withstand the dips below freezing. The Variegated Pink has come through so far just fine...keeping it watered when the temperature dips below freezing is probably also helping. Too bad Blogger won't let me upload the rotated photo!